The third nail biter of round 1 saw Brisbane hang on to win by two points in humid conditions over the GWS Giants at the Moreton Bay Central Sports Complex. It was a highly contested and scrappy match where two Irishwomen took over for the GWS Giants. Legend of Gaelic Football Cora Staunton and Cross Coder fellow Irishwoman Yvonne Bonner were key up forward for the Giants. Bonner slotted through her first goal in AFLW and the Giants first of AFLW. It was a big moment for Bonner in just her second game of women’s football. The Giants played a better quarter than Brisbane and capitalized when they needed with their limited opportunities. At quarter time the Giants had a narrow lead of seven points over Brisbane in a tight start to the match. The second quarter continued to be a real arm wrestle. 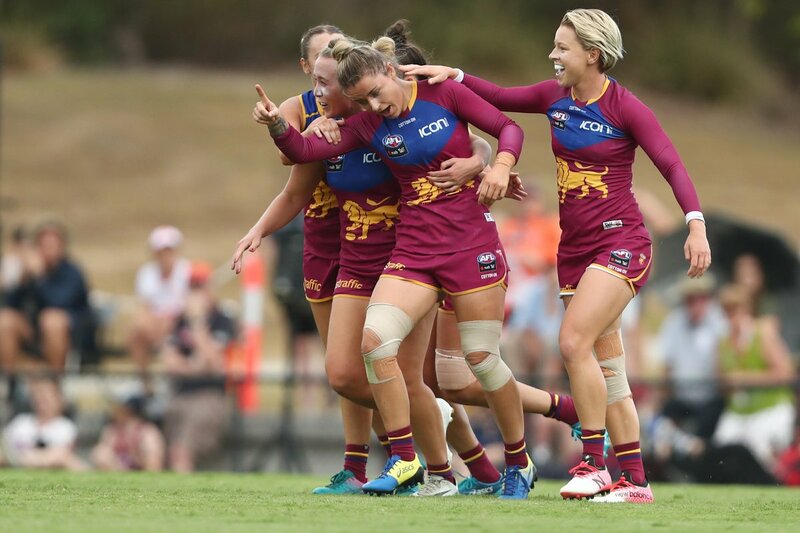 Brisbane’s Jessica Wuetschner scored the first goal for her team, as she came from nowhere and kicked a classy goal of her left-foot and the Lions first goal of AFLW 3.0. Veteran Giants midfielder Courtney Gum and the competition’s second best midfielder last season set up Staunton for Giants second goal of the match. Staunton hammered through her first goal of AFLW 3.0 from 45m out. Both goals for the Giants have come from their Irish recruits and both Bonner and Staunton have played well in the first half. At the main break Giants led by 7 points. Brisbane lifted their intensity in the third quarter and outscored GWS Giants three goals to one. Wuetschner was awarded a 50m penalty and from the goal line she gave Brisbane the perfect start with the first goal of the second half. Former Collingwood player Christina Bernardi showed a bit of flair in the forward 50 and her hard work paid off as she kicked truly for the GWS Giants. Wuetschner was dangerous in the third term, as she dribbled kicked through her third goal of the match. Both teams were evenly matched late in the third term. Brisbane was behind for most of the match and Sabrina Frederick-Traub finally put through her first goal of season three. Frederick-Traub ran riot in the third quarter. At three-quarter time Brisbane were up by a goal over the GWS Giants. Staunton was in the thick of it again in the final quarter and was the lone goal scorer in the term. She slotted through a beautiful dribbling goal and her second of the match after she broke free from an attempted tackle. Brisbane only scored two points in the final quarter. The intensity picked up in the dying minutes of the match and Brisbane was able to hold off a fast finishing Giants to sneak home by two points. The first Muslim women's and GWS Giants to play AFLW Hanreen Zreika played a good game and ended with 12 disposals, Staunton gave it her all as always for her GWS Giants finishing with 9 disposals, 7 kicks, 2 handballs and 2 tackles and fellow Irishwoman Bonner impressed on debut and finished with 6 disposals, 4 kicks, 2 handballs and 1 tackle up forward. What an electrifying end to round 1 and incredible start to AFLW 3.0, all round 1 matches were of high caliber.